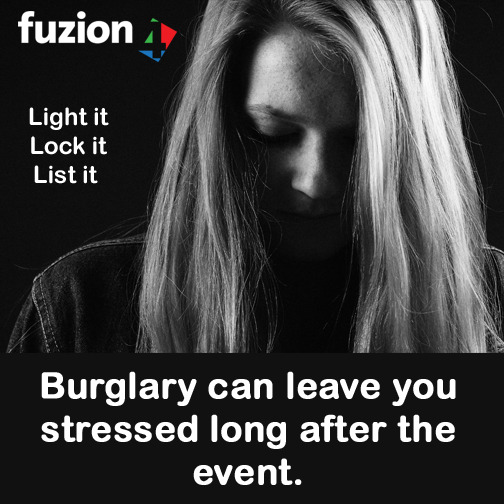 Burglary isn't just about your stolen property, it’s also about the stress and anxiety it can cause after the event. A burglary will affect people in different ways. After the burglary you can feel frightened when you’re in your own home. Security can make your home safer so you won’t have to go through the emotions of being burgled. The majority of ‪burglars are opportunists: they look for properties where they think they can enter without being seen and work undisturbed. • Install timed security lighting which stays on throughout the night. If the outside of your home is lit up, it will reveal what the burglar is up to or deter them all together. • Make sure your home looks occupied even when it isn't. Use an automatic timer to switch interior lights on and off. The burglar is unlikely to break into a house that is occupied or in this case, looks occupied. • Keep your front and back door shut and locked, even when you are home. A burglar may attempt to break into your home whilst you sleep if they see an opportunity. • Fit window locks and ensure French windows and patio doors are secure. You don’t want to make it easy for the burglar to ruin your day. • Never leave keys and valuables in reach of a letterbox or windows. A burglar can grab the keys by using an unravelled coat hanger or other long thin objects that will fit through the letterbox. • Secure your garage and shed too, the contents are just as tempting to a burglar and can be used to enter your home. It only takes seconds for a burglar to pick up a bike. • If you can, install a burglar alarm and set it EVERY time you leave your home. Have signage to let burglars know that you have CCTV setup in your home. This is the biggest deterrent to a burglar. • Install an app on your phone/tablet so items such as phones and tablets can be traced. Put a password on your mobile as well to make it harder for the burglar. • List all major objects in your home, take pictures and note unique marks. Consider using a marking system (we will be writing a blog about the different marking systems in the near future) which the police can use to identify your property if stolen. I run a jewellery shop, so I often keep all the precious jewellery and confidential documents in the safe, before closing the shop at night. Once, my shop was attacked by buglers, and they tried to break the safe lock, but failed, so all my belongings were saved. However, I had to call the locksmith experts to repair and replace the locks quickly. Since, I felt deeply satisfied with their punctuality and potential, so I would personally like to recommend them for all your safe repair needs.